I love to cook, and have developed a whole range of easy “cheats” which help make a homemade Thanksgiving easier than you may think. But, this piece is not about them. The recipes I have in mind today are less about what goes on our plates — as important as that is — and more about what is in our hearts as Thanksgiving enters. For starters, let’s talk about the whole “Go around the table and share what each of us is grateful for” practice. People keep telling me that it kinda makes them nuts, especially as it often feels forced and artificial. People may feel pressured to “come up with something” — something deep and meaningful which is “worthy” of being shared at the table, quite possibly with a bunch of people you may only see once a year. Not to mention that even for those of us who can get past all that, it often feels tired — a good practice which is now so expected, that it has lost much of the meaning it had when people began to practice it. Don’t get me wrong, I am not suggesting we give up on gratitude. In fact, gratitude is a central feature of cultivating happiness, and having some kind of regular gratitude practice has been shown to elevate our daily sense of well-being, and to strengthen our capacity to address those things in our lives which may not be going so well. So yeah, gratitude is key, and especially so on THANKSgiving. I just think that many of us may need to to find a new recipe for accessing that gratitude, especially on a holiday which turns up the pressure regarding accessing it. Kill the whole “go around the table thing,” especially if it is the one thing standing between a room full of hungry people and their food! 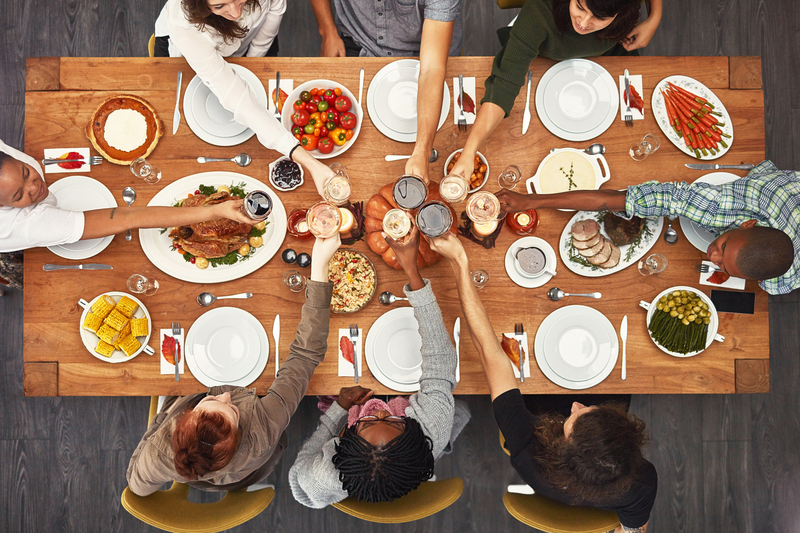 Instead, invite one person (hopefully more than 30 seconds before the meal!) to offer a very brief thought on why/how they feel grateful/blessed/fortunate to be in that particular moment, with that particular group. Keeping things immediate, focused, local and brief, helps keep people from feeling overwhelmed by the call to assess their entire lives. The one who speaks can certainly invite others to turn inward and think about that for themselves, but de-coupling public performance from experiencing gratitude, can actually help people access that very experience. Consider asking yourself and others, whatever gratitude practice you follow, to think less about the what they are thankful for, and focus more on to whom they are grateful. The good things in our lives don’t typically just come from nowhere, and even those we feel we have earned are, more often than not, connected to people, God, or some larger power that we feel operating in our lives. Acknowledging that “whom” / those “whom’s,” whomever they may be for each of us, will naturally remind us of remind us of the “what’s” for which we are grateful, and more importantly, it reminds us of the connections and relationships we have in our lives — connections and relationships which can be far more durable than whatever those “what’s” for which we are grateful may be. It’s also amazing how focusing our gratitude in such a personal way improves the relationship we have with the one upon whom we focus. Try and see. It really works! If the first two recipes are designed to ease our access to, and upgrade our experience of gratitude (which are usually “start of the meal” issues), my final recipe helps with something about which many folks are already stressing over, and may continue to stress over throughout the holiday dinner — the people gathered around the table with them. What do we do about the challenge of being forced to sit down with people we may not want to be with? How do we manage the presence of that annoying uncle? What to do about in-laws that are emotional out-laws? I would suggest taking deep personal pride, and great comfort in their presence. You need not spend the afternoon or evening cuddling up with them, but maintaining the presence of such people in our lives — of breaking bread with them in good times and in bad, for example — speaks to our ability to open our hearts to others, not because of who they are, but because of who we are. It also reminds us that we can be more generous and kind, if only occasionally, than we initially feel like being (e.g. we really are that better person most of us would like to be). That too is something for which to be grateful, and a way of reminding yourself to take a moment to be grateful to yourself this Thanksgiving. And if you are like most people, by the way, you deserve a larger helping of that this holiday season than you are likely to take. Not to mention that it’s definitely healthier than a larger helping of potatoes!